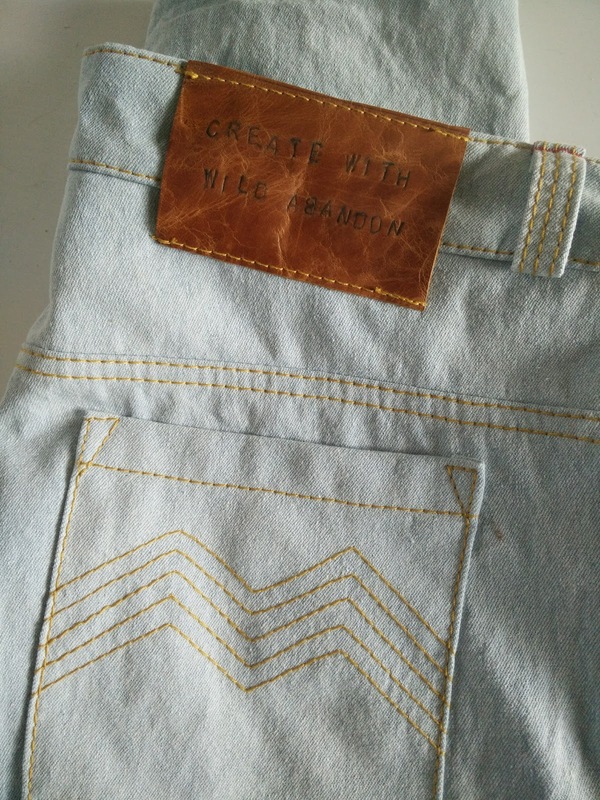 About three years ago I made a couple of pairs of Named Wyome Boyfriend Jeans. Those were made in a size 38 and were quite close-fitting. This time I wanted a looser fit like the cool kids I see on Pinterest. So, for this pair I went up two sizes to a size 42. For my previous, tighter pairs I had altered the crotch curve for a better fit. This time I didn't make any alterations to see if the original cut would give that classic boyfriend look in the larger size. I think it did! The only changes I made this time were to enlarge the back pocket and use a zip, rather than a button fly. To achieve that faded, worn-in look, I used a gorgeous enzyme washed denim from Tessuti, purchased with a gift voucher from the best internet sewing friend ever. This colour denim doesn't seem to be available any more. It is soft and gorgeous and perfect for these jeans. I topstitched with gold Rasant thread from Homecraft Textiles and added a leather tag. I managed to stamp the B on backwards, but you'd have to be looking way too closely to notice when I'm wearing them. Jeans topstitching is one of my favourite things to do. So satisfying! These photos were taken months ago when it was cold enough for snuggly jumpers. I don't know where the time has gone. This particular snuggly jumper is the Brooklyn Knit Top by StyleArc. I've made this one in a quilted knit fabric from Textile Traders. It's a simple pattern with pockets and a roll neck and the resulting jumper is cosy and slouchy. I wore this a lot over the winter. Now I can slouch about with the best of them! I love both these patterns and I am very happy with the looser fit on these jeans compared to the previous pair I made in my 'proper' size. I have worn these so much since making them as they always feel so comfortable and fashionable. The colour also goes with everything. What a great look! Such a shame the winter's gone, but you'll look forward to wearing this outfit again in a few months! I'm about to make a pair of boyfriend jeans in wool denim (! ), and hadn't considered this pattern. I'm off to check it out as you look very cool! Well, I think we'll need to add your photo to the cool kids Pinterest page Meg :) you rock the slouchy look! You nailed the fit with these and I looove the colour! You make the best jeans! Love the slouchy look...cool and comfortable. Love your topstitching too. very beautiful dress :) i like your good idea ,Thanks for the inspiration! Hi - I really like the look of your jeans (and your blog in general - very inspiring!). I am working on boyfriend jeans myself, and am very interested in the details of these. Is it correct that per the measurement in the pattern you should use size 38 (I saw your versions in size 38 too, looks very good also! But I am looking for this more slouchy look), and here you used size 42? Did you use size 42 all over (eg the waist)? Thanks!